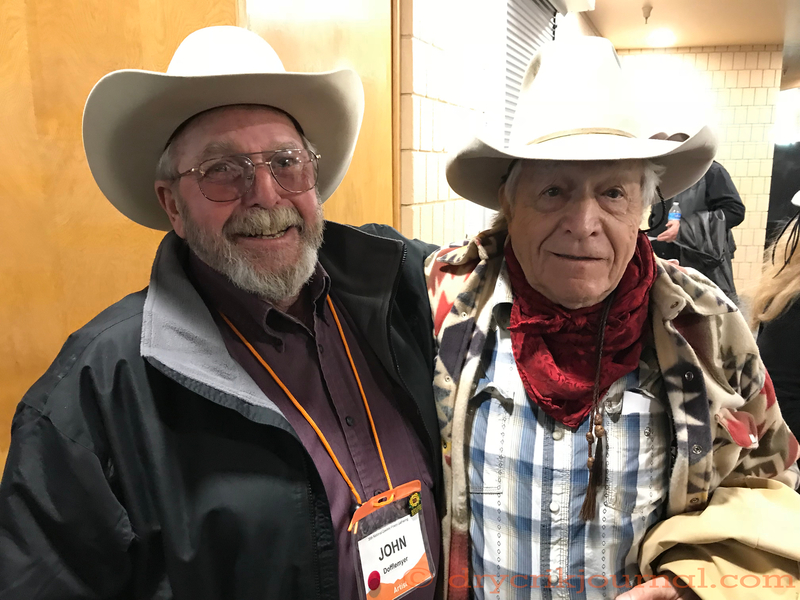 Robbin and I are finally home from Elko, taking the two-day, long way across the Great Basin to reflect and recuperate from too much fun with old and new friends – the special reunion that the Gathering has become beneath the multifaceted offerings on its many venues. When I first arrived in 1989, it was pretty much traditional recitations with very little contemporary expression – half-dozen books for sale – but there was an amazing ‘lost and found’ camaraderie that inspired us all and sparked similar gatherings all around a disjointed, cowboy West of those days. Mediums of contemporary expression are as varied as technology will allow today, going well-beyond its poetic beginnings, an explosion of all kinds of art, music and video as Cowboy Poetry has evolved, trying, I think, to offer and reaffirm an ethic common to us all, apart from the uneasy business of media hysterics. Breakfast with the Hungarians Monday morning, before the Gathering got into full swing, confirmed to us that this ethic is not limited to the American West, or to the U.S., as we discussed the details of annual and perennial grasses via Agnes Kemecsei, the translator. Jammed around a table in a corner of the Stockman’s coffee shop, the air was thick – and I was reminded of that camaraderie back in 1989, that shared feeling of finding others whose livelihoods depended on grass, who also took care of livestock. It was a wonderful beginning to the Gathering for us. The rest is, of course, a blur with too little sleep – serendipitous highlights and diversions – ample inspiration for another year to be sure.